I usually make Father’s beef stew in a Dutch oven. That is how I learned to make it some fifty or more years ago; it has become one of my personal traditions. It seems, however, that some days are way shorter than others and you don’t have the time to cook all the way from scratch. Not so often these days but using a slow cooker was a frequent occurrence in the years before I retired. 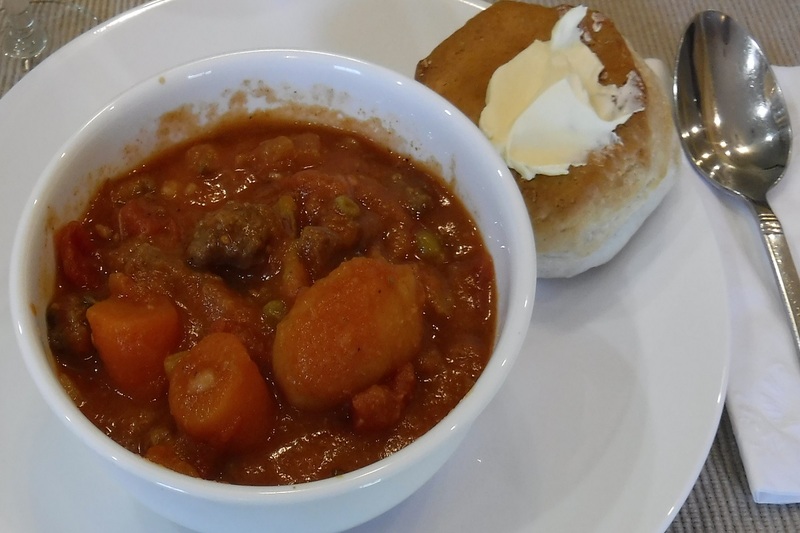 If you have enough staples in your larder and with a little preplanning you can have a big pot of hot beef stew waiting for you at the end of the day with only about a half an hour’s prep-work in the morning. 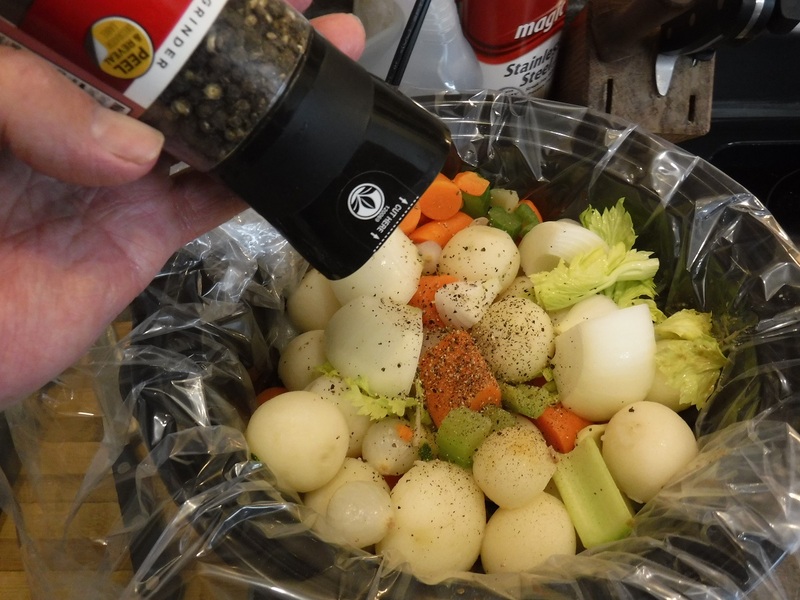 During this cooking session I tried out some of the slow cooker liners intended to help in the laborious clean-up chores. I will give you my impressions at the end of the recipe. 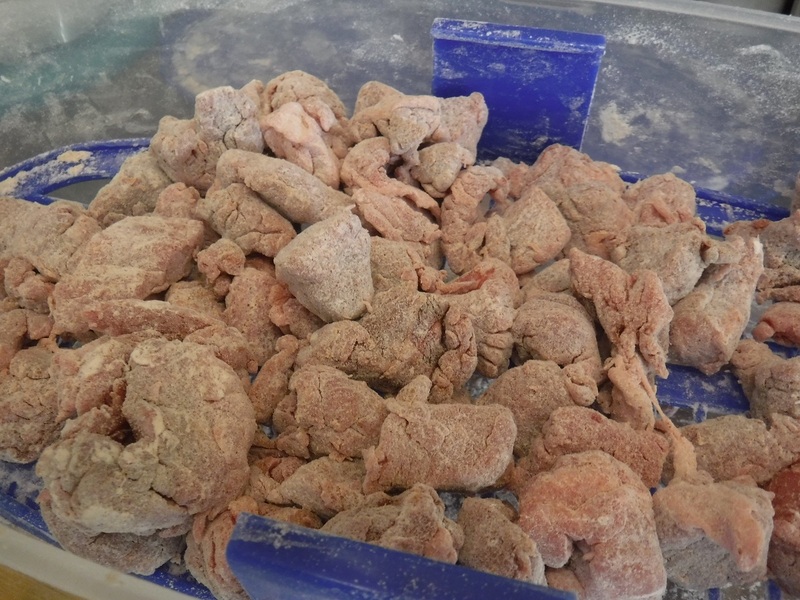 Dredge the beef morsels with a thin coating of seasoned flour. (I used some pepper, seasoned salt and paprika with this batch.) Allow to set for five minutes to let the flour adhere to the meat. Heat a large frying pan. 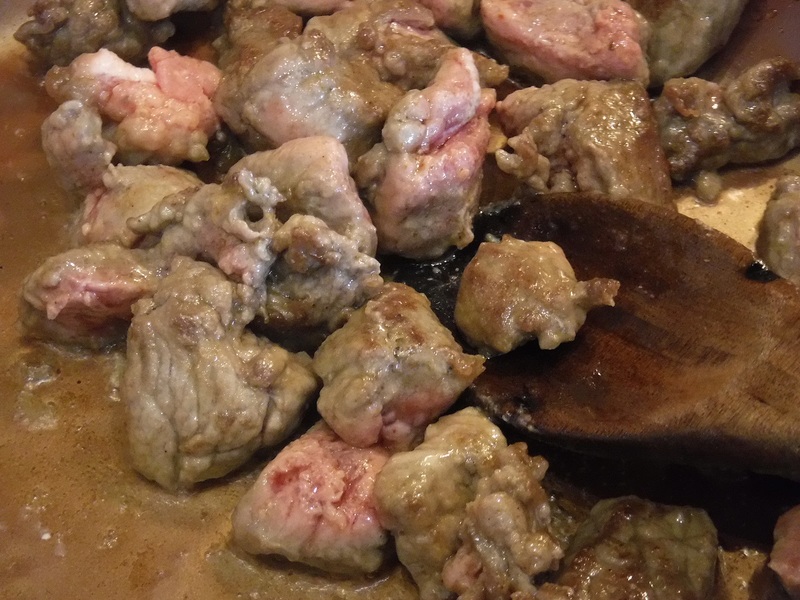 Add a few tablespoons of olive oil and fry the beef morsels in batches; do not over crowd the pan. Cook to a nice Maillard brown. Remove from the pan and set aside. Repeat with the remaining meat portion. This is to brown the meat and it will finish cooking in the sauce. Deglaze the pan. I used about ½ cup of a drinkable red wine but you can use broth or stock of your choice or even water. The object is to get the brown bit on the bottom of the pan and into the sauce. Cook and stir until liquid is reduced by half. 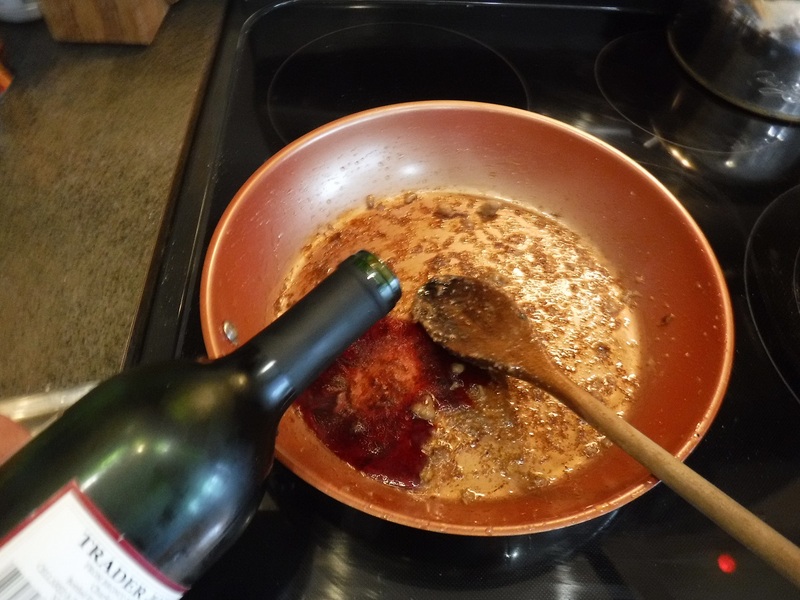 Pour the reduction into the cooking pot. If you are using an alcohol based liquid please follow safety precautions to prevent burns and fires. Add diced tomatoes and pan dripping s to cooking pot. 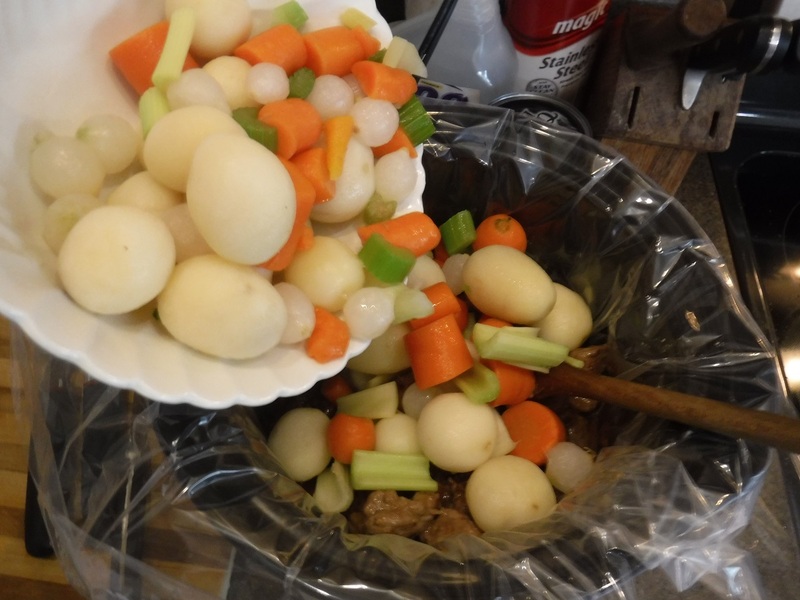 Add the reserved browned beef morsels, Add the defrosted stewing vegetables (Usually consists of potatoes, carrots, celery and onions – proportions vary with the brand). Add any additional vegetable of choice. Pot should be heating on high. First round of seasoning: I used a generous portion of ground black pepper, some sage and seasoned salt, a bit of nutmeg and two tablespoons of beef base (instant beef or bouillon cubes). 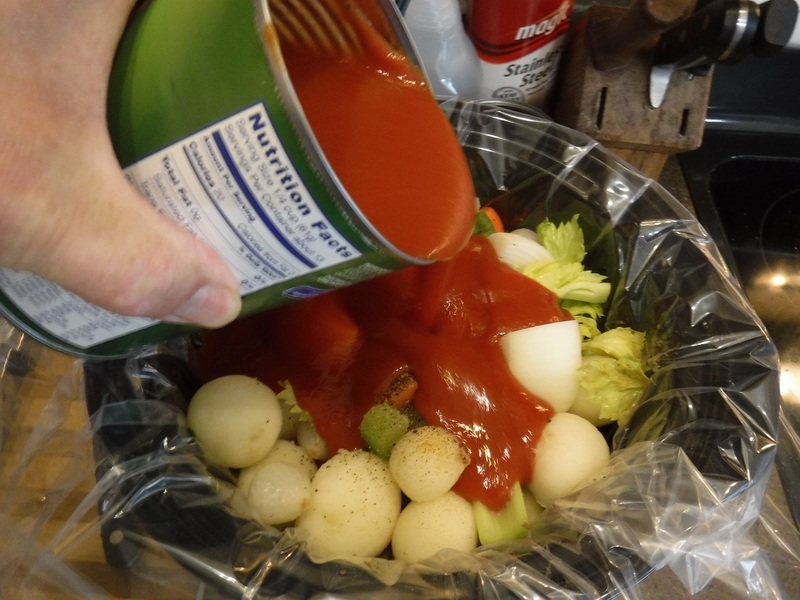 Add the tomato sauce. Add enough water to bring the level in the cooking pot to just below the lid ring – usually takes about a quarter to half a cup. Do not over fill, the liquid expands a bit when it heats. Gently stir the top layer to submerge the vegetables and mix any of the spices into the liquid. 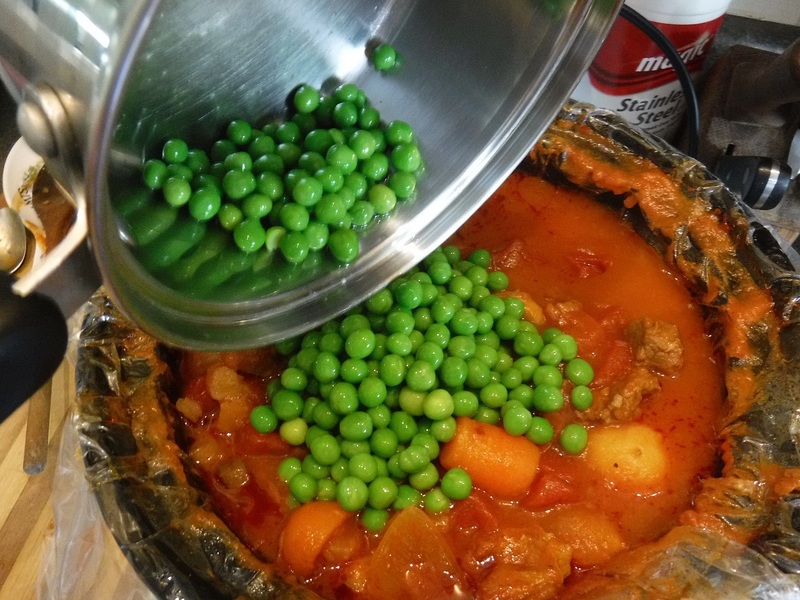 (That is a throw-back instruction from the early days of Crock Pots® when small elements heated slowly from the bottom and meat and other durable items were at the bottom and we were to not remove the lid because it took too long to come back to temperature.) Indeed, the meat is at the bottom where it is the hottest and the more fragile vegetables are at the top. Cover and heat on high until you see bubbles . Reduce to the low heat setting. You can let it cook as is for the next 5 to 6 hours or until the meat and vegetables are tender. However, after two or three hours I like to give it a stir and taste. 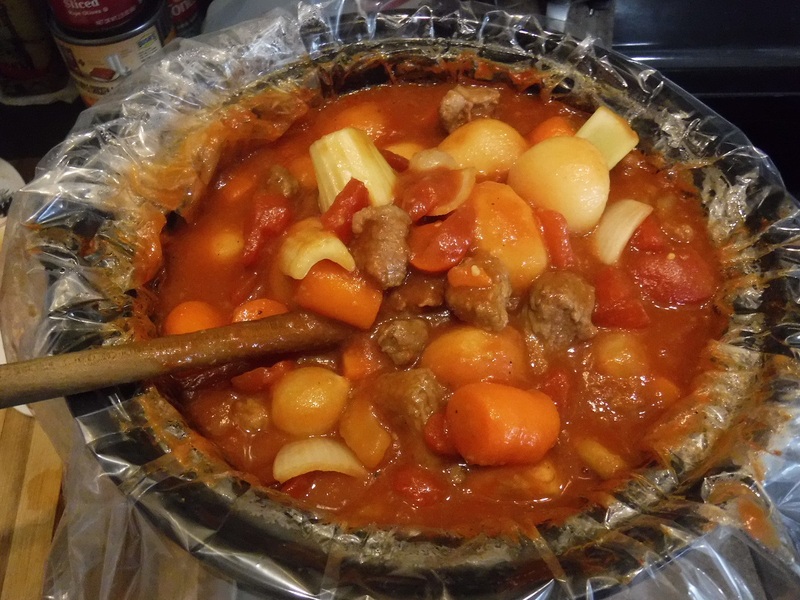 I usually add a bit more beef base, some chili powder and cumin to taste, and some pepper – it rarely needs salt. Cook the peas in salted water until just tender. Drain and add to the stew just before serving. Stir to combine. Serve with your choice of hot buttered biscuits, French bread or crackers. 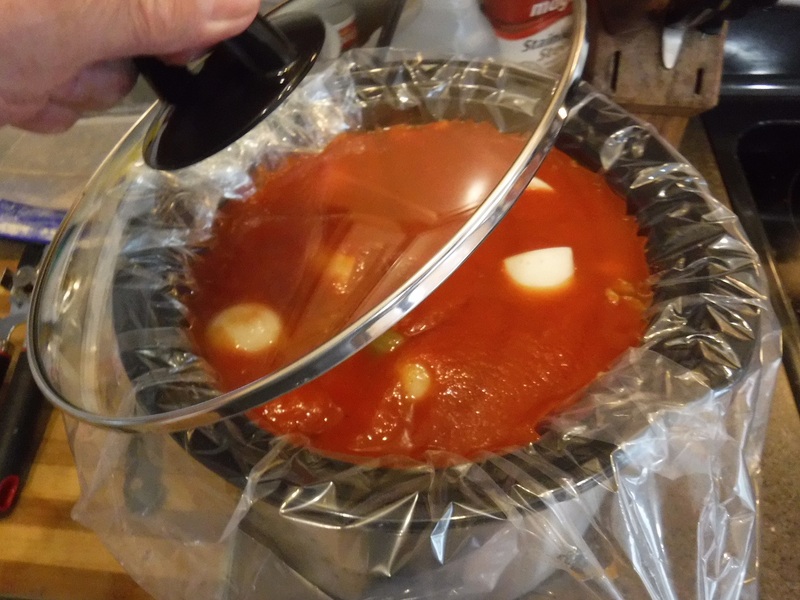 The slow cooker liners work very well. The crock need little more than perhaps a rinsing before putting away. It certainly is a clean-up time saver. However, I did discover that one member of the family was not at all pleased with the new way of cleaning up after the meal. Chena, our Canadian husky, believes that crock cleaning is her duty and right and I might add she does an excellent job. So, as long as we have Chena, we probably won’t be using the liners very often. These are just a few suggested additional or alternate ingredients. These are durable vegetables and will cook for long periods and still maintain their shape and texture. 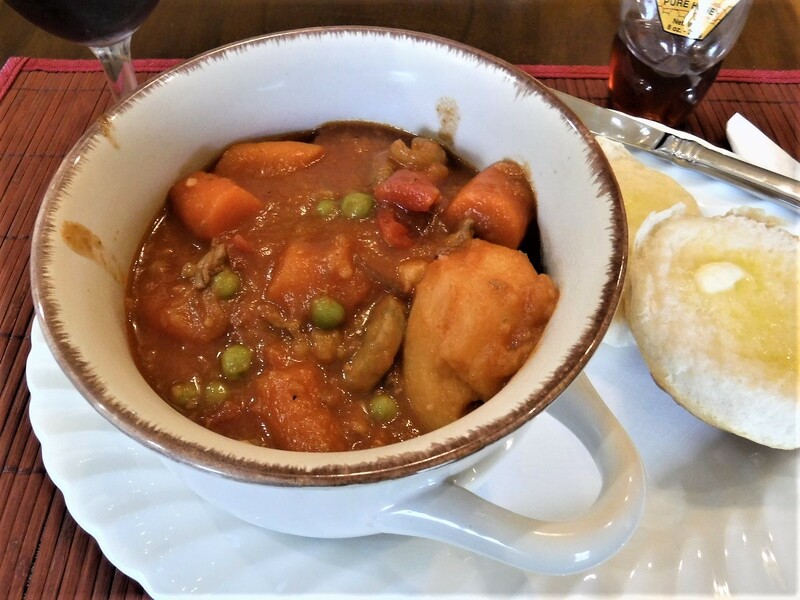 You can use softer vegetable such as squashes but I would suggest cooking them separately and adding to the stew mixture just before serving.